Our most revered tool and, if you’re a new Kurean, our most feared. From here on out our lives revolve around these buckets. From the time of your first conversation with the Kure team leaders, be it interview or a basic “get to know you”, these buckets are front and center. I’m not talking about just any, run of the mill bucket either. I am specifically referring to the perfectly engineered 5 gallons, BPA free, high-density polyethylene Gods that sit stacked within one another patiently waiting to be stuffed to the brim with all sorts of random accouterment needed for a remote six-month long field camp. From socks and hats to hand brooms and bug spray, these cylindrical vessels almost seem bottomless in volume and possibility. These buckets are truly an engineering marvel. A simple design, they feature a set of Saturn-like rings at the top of a uniform cylindrical shell. These rings not only help to reinforce the shape and help prevent distortion but also keep the buckets from becoming one solid unit when stacked together. Just below the rings is a simple metal handle, faceted with a small plastic tube made of the same material as the buckets that serves as a grip. However, not all buckets are created equal. Though the general idea behind the form and function of these buckets is the same, the buckets themselves vary to a degree. The difference between ring spacing for example, though minuscule to the untrained eye, is rather monumental to those who know how to look for it. 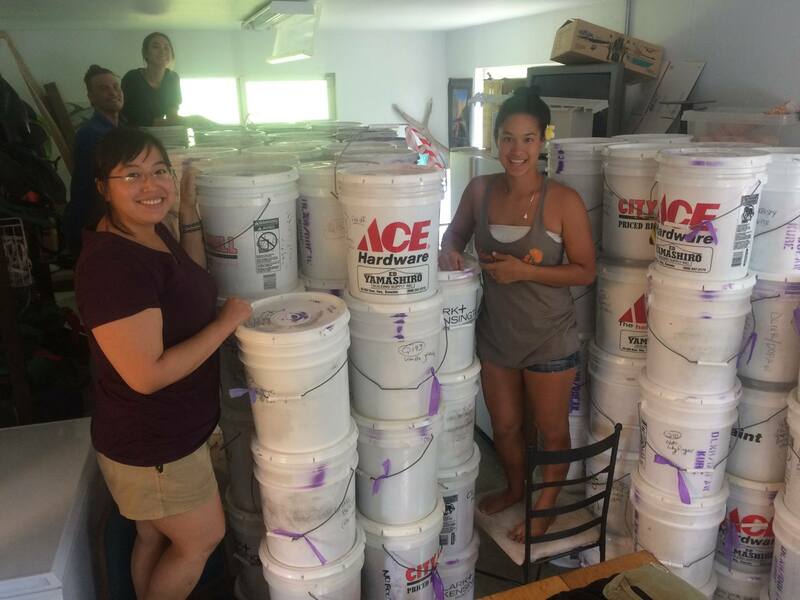 Some buckets are slightly taller than others or have a slightly larger diameter than others, making them difficult to stack or unwilling to separate. Then there are the rogue buckets, that refuse to get along with any of the others at all. Completely non-stackable, these vigilante buckets throw off the entire flow of the pack- unpack cycle that is performed daily. Rendering them useless, they are cast aside into their own little colony of misfit buckets forced to watch as the others so gallantly fulfill their duties. That is until that one perfectly odd shaped item comes along, and the misfit buckets are finally able to shine in all their unconventional glory. Which brings us to lids. Just as is true with the buckets, not all lids are created alike. Akin to their cylindrical cousins, the lids are made of the same high-grade commercial plastic and come in a variety of shapes and sizes. Their varying dimensions allows them to be paired and matched with multiple different buckets acting as the ambassadors that bridge the gap between bucket groups. A daily waltz unfolds as these unworldly objects are washed and rinsed, wet and dry, empty and packed, only to be emptied once again. They are battered and bruised and forced to wear the brands of their contents, but they are our friends and family. These buckets become an extension of our own selves and we in return are forever indebted to them. That is until one cracks and then all bets are off.